Me too. I wish I could do more of these. Hi Joan, thank you so much for your comment. It really encourages me to get positive feedback like yours. This is one of my favorites of your work. It is just beautiful, and I so love the red poppies. You are inspiring other artists! I am not an artist but decided to try old-fashioned watercolors on paper, because I am inspired by you and always loved watercolors. Great work, Kerry! I am enjoying the variety of types of painting you are producing! Hi Leigh, Let me see some of your watercolors. I’ll post them on my blog. It’s the least I can do. I just love your art work. Your choice of color speaks volumes. I’m sorry to be so slow in replying to your wonderful comments. Thank you so much. It really encourages me to hear from readers like you, Kimberly. Um…sign me up for this club! Yep, we’re an isolated little club. Do you post any of your art work on any Facebook pages? I like to do that because I get in touch with other artists. If you want the names of the pages where I post, let me know. I just recently signed up for a bunch more. But I don’t know how good they are. Beautiful work! I love all the colors and you’ve really captured the magical beauty of the sunset. It’s a scene I wish I could step into! Thanks for your comment. I’m so glad you liked this piece. I’m with you, let’s jump into this field of poppies! I can se why so many enjoyed your painting, it’s a great piece. Has a surreal feel to it, and the simplicity draws me in. The best for me is the light, love it. Thanks, Mary, for your comments. The light of the sun was done with a special digital brush called, of all things, the glow brush. It has really cool effects. My husband was completely wowed by your work. He has been wanting to try regular painting but when I showed him your work, he wanted to try it. What do you use? How would he start? Thank you so much for your comment. I use an app called Painter. It is made by Corel. You can download a 30-day free trial from them. It has a steep learning curve for most people. 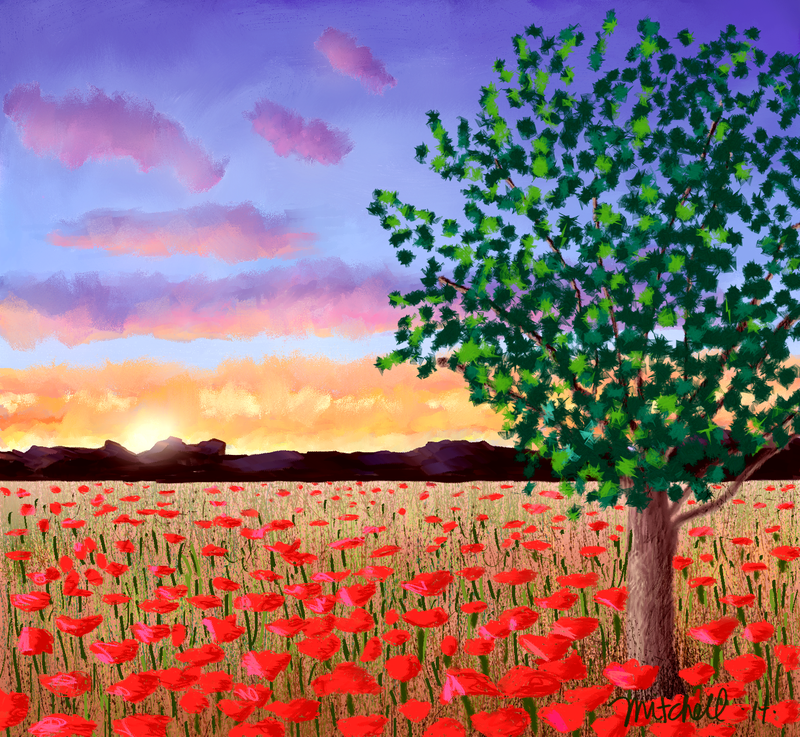 I took classes at an on-line place called the Digital Art Academy to learn how to use Painter. They have a great beginning course. It is three four-week sessions. Another option is to start with an app called Paint Shop Pro. It costs much less and is easier to learn. It does many of the things Painter can do. It can also be used for editing photos. If I can answer any other questions, let me know. I can’t tell you how uplifting I find your work to be! What a talent you have! Again, thank you for sharing! Hi Pepper, Thank you so much for your generous comments. Thanks for you comments, they are very nice. I use a program called Painter X3 by Corel to paint. It comes with many kinds of media, like acrylics, chalk, pastel, watercolor, oil, pencils, etc. It comes with over 700 brushes. I have to run it on a very big computer with lots of ram, because it gives a 3-D effect to the brush strokes and uses a ton of memory. I use a tablet by a company called Wacom. It is just like drawing on paper, drawing on the tablet. I could never do this with just a mouse. It would be impossible to do my art without a tablet. It makes all the difference. Wacom has one called the Bamboo, which is much more reasonable than the one I use. There are also tablets available for use with the iPads and similar items. You’ll love working with a tablet. It is a huge difference. Lovely. Where I am at the moment there are countless poppies but the breeze is too much to take a decent photo as the basis for something similar. Very frustrating! Thank you for sharing the FB group. I agree with you totally about the advantages of digital art! Thanks for your comment. Too bad you missed the photo. But maybe you can dig it up from your memory. I just started doing landscapes and totally don’t know what I’m doing. Right now I’m using reference images to get ideas and figure out colors. I’m working towards coming up with my own ideas, though. I love the colors in your work. Red is my favorite color as well. It’s nice to know that you can share your struggles and triumphs with others. Thanks for sharing the Facebook link. I haven’t joined Facebook yet. At first, I had some reservations as to whether it would be appropriate for my artwork, but I think I might check it out when I get the chance. A lot of people have concerns about FB. But I just decided to go ahead. At first I only belonged to two private pages to post my art work. Now I’ve joined a bunch, but some of them are weird, so I’m deleting them. The Magically Mixed Art group is by far the best and friendliest.